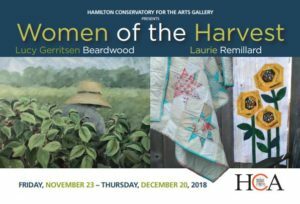 This exhibition, “Women of the Harvest”, explores the love, nurturing and friendship that women have traditionally given to enrich their families and community. Needs have evolved and changed in urban and rural communities, but the qualities of strength and endurance remain. As artists, Lucy and Laurie have mentored and encouraged each other over the years, and these bonds of friendship are also a reflection of them as Women of the Harvest.